Goalkeeper Loïc Maxime Feudjou has been nothing less than a sensation since joining Cameroonian giants Cotonsport FC before the start of the MTN Elite One 2012. It’s not often a young goalkeeper makes such an early impression. 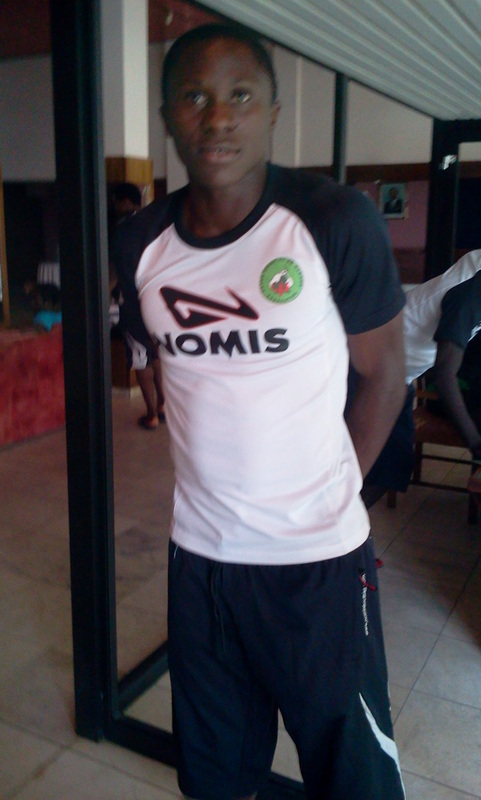 Feudjou started his career at Botafogo FC from Douala, currently playing at second level of Cameroonian football. In June 2011, Feudjou was named in the squad of the Cameroon U-23 national football team. Botafogo FC was playing at third level of Cameroonian football in the season 2010-2011. According to unconfirmed sources, Feudjou has been a trialist at Spanish side Real Zaragoza. He has also been linked to several French clubs. In December 2011, Feudjou was signed by Cotonsport FC. The flagship of Cameroonian football also signed Jean Efala Komguep from Fovu Club, widely considered as the biggest goalkeeping talent in the country. Most experts of Cameroonian football had thought Efala Komguep would fight for the number one shirt with Nigerien international goalkeeper Daouda Kassaly. However, Feudjou was selected for the first match of the season and has never looked back, establishing himself as the regular goalkeeper with several clean sheets and match-winning saves. Cotonsport FC has currently played 13 matches, having only conceded five goals. Feudjou has played most of these matches, probably at least 10 of them. As a result of Feudjou’s dominance, Efala Komguep is unsettled and apparently looking for a new club. In February 2012, Feudjou was rather sensationally named in the squad of the Indomitable Lions, the Cameroon national football team. At the time, Feudjo had played approximately five games at top level of Cameroonian football. On 25.03.2012, Feudjou made his debut in the CAF Champions League 2011 against Dolphins FC of Nigeria. Feudjou saved a penalty and his performance was described as “outstanding” by MTN Football. Cotonsport FC advanced to the second round, playing away to Berekum Chelsea FC of Ghana on 29.04.2012. Feudjou made another wonderful performance and kept a clean sheet, making several decisive saves. Feudjou is born 14.04.1992 and has therefore turned 20 years old a few weeks ago. According to Camfoot, usually a reliable source, Feudjou is 182 centimeters and 74 kilos. In other words, Feudjou is rather small for a goalkeeper. Feudjou’s major strength is his cat-like reflexes and quick reactions. Feudjou’s shot stopping is brilliant and his good positional sense and judgement makes him an all-round goalkeeper. Apparently, Feudjou was initially an outfield player, suggesting he is good with his feet and a good ball player. My biggest concern is obviously that Feudjou could lack the height to play in a tough European league – although that does not seem to be a problem to goalkeepers such as Iker Casillas of Real Madrid, who is also 182 centimeters. Feudjou is very athletic and a true professional. He seems very sincere and reflected in interviews I have read. I find it rather obvious that Feudjou is a rare talent and if it is developed in the right way, he could be a future star of Cameroonian football. The full name of Feudjou is “Loïc Maxime Feudjou Nguegang”. The picture is taken from Lechabba.